We use Yelp to help us find good cheap local food while we travel. Here in the south, Jack’s on a constant mission for seafood, and his criterion is simply how close to the fishing dock he gets to eat it. 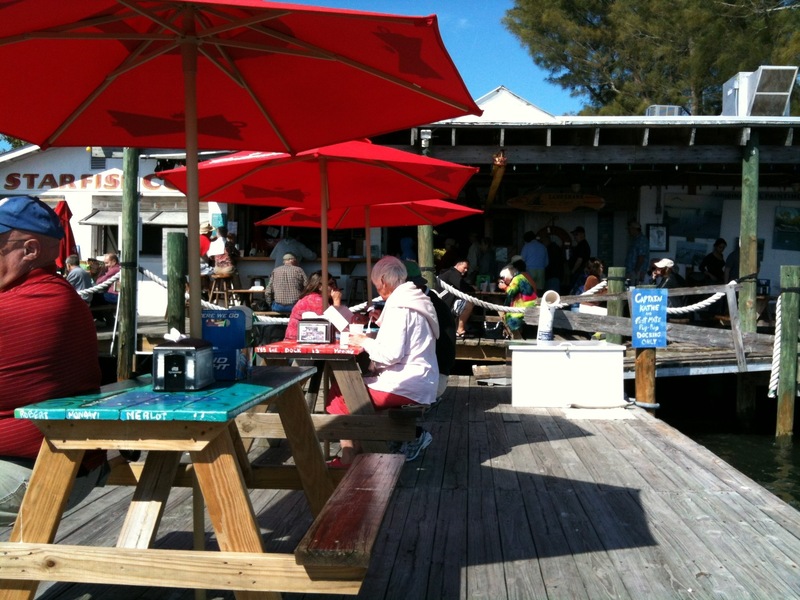 We found exactly the right place in Cortez, FL, called the Star Fish Co. It was obvious the Yelp reviews were true when we saw the line snaking around the picnic tables and waited on the windy dock for an hour just to order. 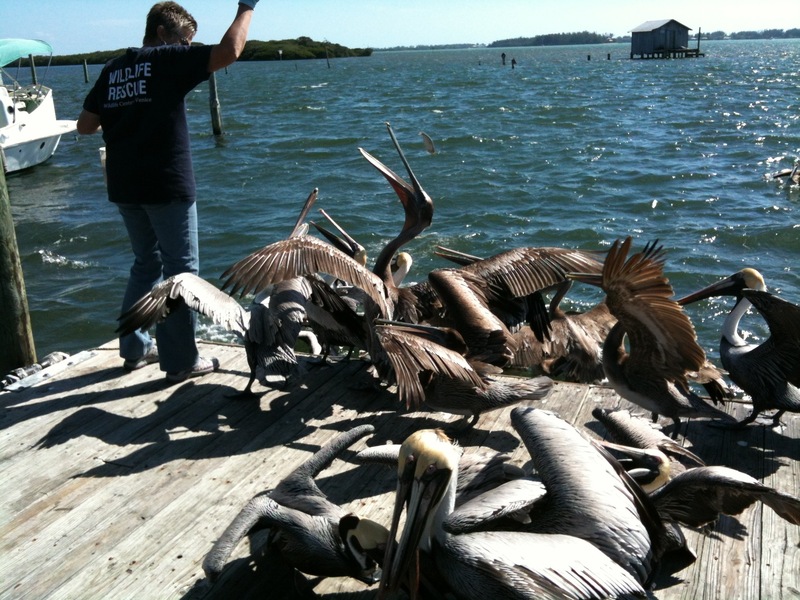 While we stood there, a woman wearing a Wildlife Rescue t-shirt walked out onto the dock with a death grip on a pelican with one arm, her other hand clamped around his beak. Conversation stopped as she made it to the end of the dock and released the pelican into the water, then we applauded her and she smiled and gave a little nod. “I’ve got two more!” she said with a wave and kept on walking. We made it to the order window and got distracted with our menu choices and missed the other two pelicans being released. After we ordered we wangled a table out on the end of the dock to wait for our food. Wildlife Rescue woman came back out, this time with a small bucket of fish. “Where are you rescuing them from?” I asked. I gasped as I realized what she was saying. “From fish hooks,” I said, and the picture in my head wasn’t pretty. 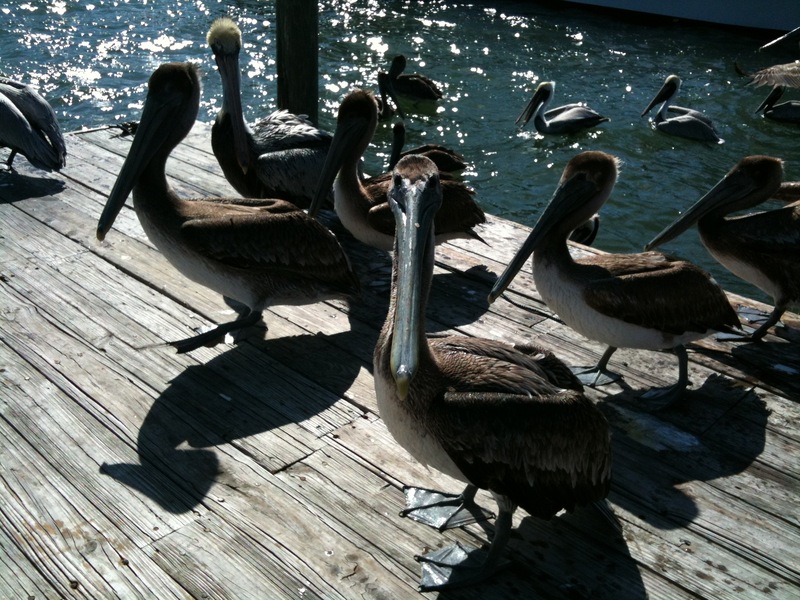 While we were talking, the 20 or 30 pelicans in the area flew up onto the dock and were gathering around us, focused on that little bucket and looking pretty annoyed with me for holding up lunch. Wildlife Rescue woman pointed at one of them. “I think he’s blind in that eye.” His eyes were different colors, but I couldn’t tell which would be the good one. “I’m going to watch him, and if it looks like he’s losing weight I’ll take him in,” she said. Then she pointed at another fellow waiting none too patiently for the fish. “And you! You were with us for about six months, weren’t you?” Even though I couldn’t distinguish one pelican from another, I didn’t wonder that she could. We hand fed dozens of squirrels back in our old life, and I could nearly always tell them apart. The pelicans were starting to crowd us and I offered the obvious “I think they want your fish” and went back to our table to watch with a little envy as this woman about my age went about her work. She tossed fish to each one and observed carefully for any signs of ill health. She made sure the one with the bad eye got a couple of extra fish and gave a last long look at them all before she headed back down the dock. Our food came and we started to eat. 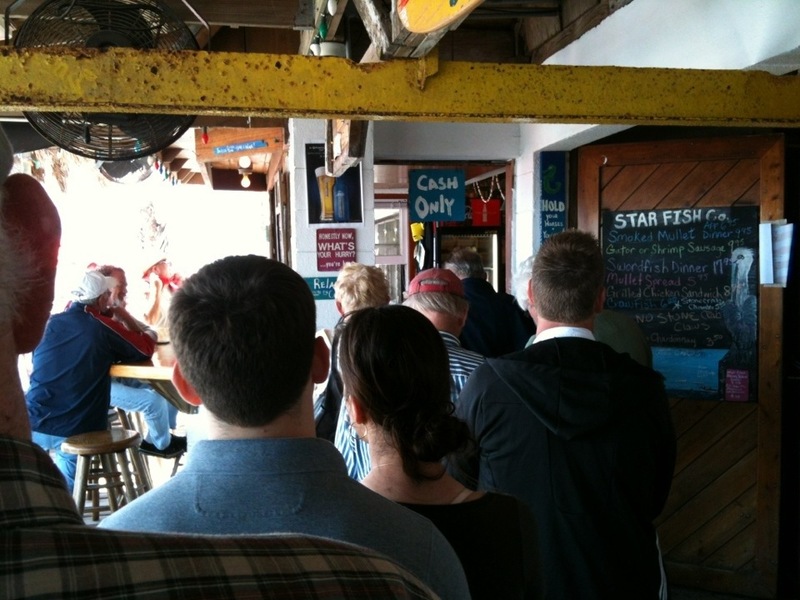 Wildlife Rescue woman disappeared through the crowded line at the Star Fish Company. A few minutes later the pelicans suddenly rose up out of the water and flew down the street. We watched until we saw her appear with another white bucket. Not a bad gig, I thought. Then I noticed the streak of pelican poop splattered across my hoodie.